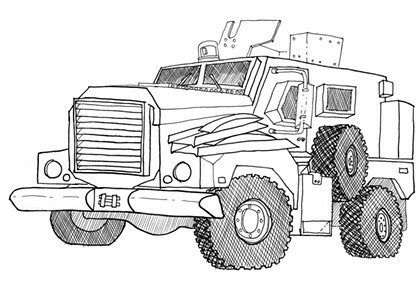 Vermont State Police obtained an MRAP armored vehicle through the 1033 Program. Updated at 2:15 p.m. to include comments from Attorney General Bill Sorrell. An influential state lawmaker will introduce a bill to restrict police agencies' use of the Pentagon's surplus equipment program, which Vermont agencies have used to obtain an arsenal of assault rifles, Humvees, night-vision goggles and other military gear. Janet Ancel (D-Calais), chair of the House Ways and Means Committee, told Seven Days she is concerned that police are obtaining military gear through the federal 1033 Program with little oversight or public debate. Ancel expects the House Government Operations Committee to hold hearings on her bill in the upcoming legislative session. "I want public discussion and legislative focus on the program," Ancel said. "I have concerns about the use of military hardware, particularly by some of our smaller law-enforcement agencies. It's a subject we need to discuss. The bill is a vehicle for the discussion." Currently, police apply directly to the state's 1033 Program coordinator, an official with the Vermont National Guard. Often citing the war on drugs, agencies ranging from the Vermont State Police to the Middlebury Police Department have obtained 158 assault rifles, 14 military Humvees, one mine-resistant vehicle, and scores of scopes, sights and other equipment, according to a Seven Days review of nearly 4,000 pages of documents. Law-enforcement agencies have requested, but been denied, more than twice as much stuff. Ancel said her bill would establish a state official as an overseer who would approve or deny police requests to the Pentagon and write rules governing training and use of the equipment for individual departments. It is modeled on a bill in New Jersey, Ancel said. Ancel said multiple lawmakers have indicated they would be cosponsors, but the bill is not yet finalized. In her preliminary draft, the attorney general would be the state overseer, Ancel said. Attorney General Bill Sorrell initially seemed interested but has expressed concerns more recently, Ancel said. Sorrell told Seven Days that his office may not be best suited for the task. New Jersey is one of five states in which the attorney general is appointed by the governor and therefore has direct oversight of the state police, Sorrell said. Sorrell is independently elected, and has no formal supervisory role over the state police or other police agencies. Sorrell suggested that the Law Enforcement Advisory Board is a "better fit to exert authority over the 1033 Program." "If the Legislature wishes it to be the AG, we will do some further research to try better to understand how resource-intensive this task might be,' Sorrell added. You can see how much military equipment your local police agencies have obtained through the 1033 Program in this interactive database.